RvmTranslator4.0 beta version is released! 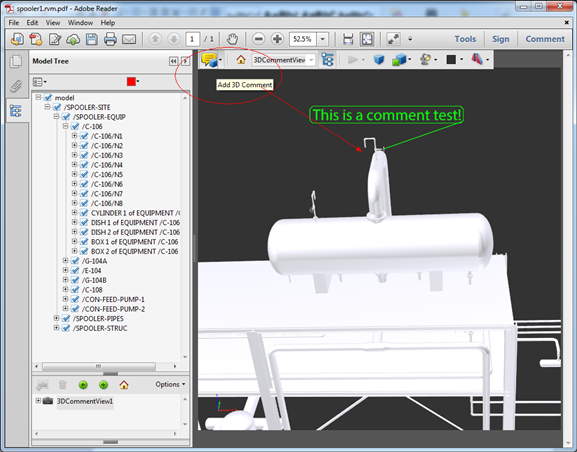 The big change is able to translate RVM to 3D PDF, including the design element hierarchy, color information. 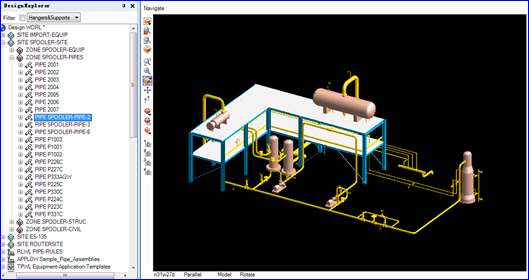 The 3D PDF file is smaller and can add comment and measure the distance, angle, .etc, so 3D PDF is best suited for the model review workflow for plant design. I am impressed with your translator and able to translate the spooler with no problem. However when I tried to convert a few RVM files of mine (around 60MB-70MB), it alsways stop about 5minutes of processing and said RVMTranslator not responding. The 4.0 Beta version of RvmTranslator only can translate text RVM to 3D PDF. And your RVM files are too large for RvmTranslator, especially the binary RVM files. I think you can export smaller RVM file to have a try. Thank you for your quick response, really appreciate it. Would like to ask if you have any tools/recommendations to segregate the large RVM files (70MB) into smaller portion without exporting? Sorry, I have no tools to split RVM files. 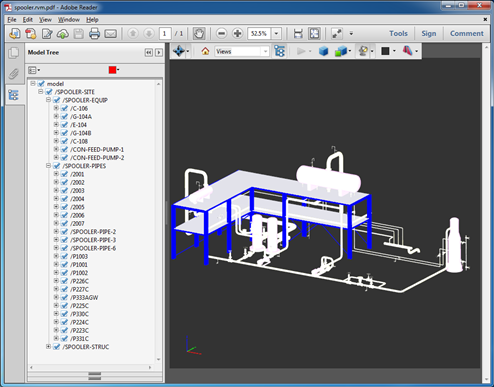 You can export smaller RVM files from PDMS, such as a RVM file only include one SITE or ZONE. Is it possible to output model in PDF with different colors (based on RVM)? Yes, it is possible to set model color in PDF by RVM files. The RVM contains color info. Hi do you know of a way to subdivide the .rvm when I export it from PDMS without manually selecting each section? I currently have a zone file that exports to be around 300mb as a text file and the translator bugs out. I have done some smaller files with sucess but some of them keeps on telling me that my .rvm file is faulty (when I export as binary) or that the translator quits in a bad mannor (when translating as a text). I do not know the way to subdivide rvm file except manually select them. That is a known problem of RvmTranslator to export so big rvm file. RvmTranslator4.0 now only can export text rvm file to 3D PDF, the binary rvm is not supported. Thanks for the response, I will try and write a macro to automate the output from pdms (my programming skills is not at your level though). A suggestion for the next update might be to allow your program to do a series of files and export them one by one. Currently I am exporting frol PDMS to Solidworks and your converter absolutely does the trick with the IGES format. The only issue is that it takes forever to do 100 smaller files given that even solidworks is having a problem processing large files. Kudos for your PML macro skills. Current version have this functionality to translate multiple files one by one. Yes, solidworks have problem for larges files. For solidworks I think it also support STEP files. however I need to translate these files in an automated way, either by looping through it, since clicking 925 times will make my finger quite numb, is there a way to do this? Of course, there is an automated way, that is use RvmTranslator in the Batch File, such as the RvmTranslator.bat does. I managed to write a loop and edit your batch file. Is it possible to ask you to email me the conversation tables that you used originally for the RMV translator for the IGES format? I would highly appreciate that. At current moment using your form PDMS export binary RVM which can't be converted by RVMConverter (but hope it will be possible in future). Thanks for updates! You added menu for selecting binary or text rvm. Can RVMT translate binary rvm now? Is it possible to translate colors of 3d model into PDF? Or may be just add option to your utility to load file with color rules? After converting model is dark and required to be colored before using. If it possible to transfer colors into 3d PDF automatically it will be big advantage. In any case thanks for your efforts! Yes, RvmTranslator can translate binary RVM. 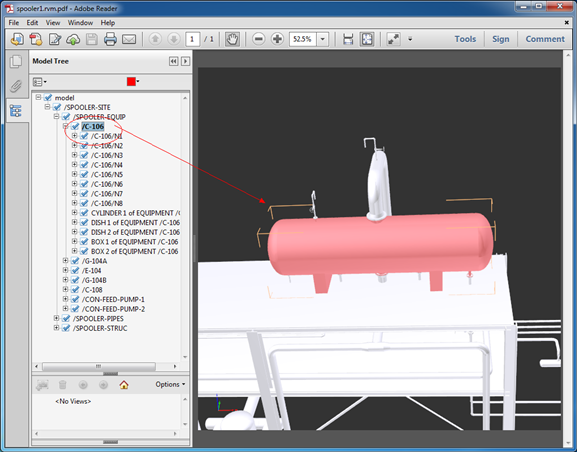 Yes, it is possible to translate color of 3d model into PDF. Translating binary RVM is not working for me. But in any case I can produce TEXT rvm and now it's enough. Using your utility I can convert rvm into pdf w/out running Review. It's more easy and faster. I have checked the binary rvm export, it works. Yes, I agree with you. 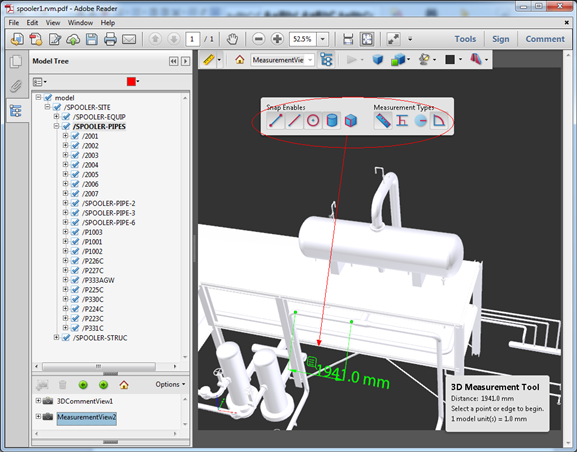 The 3D PDF is useful for small model with notes by email or internet to discuss their design.